Hey everyone (including new followers!) --an update from Queens, New York here--I obviously still have power (it flickered ominously for a good two hours, but held on; I'm hearing that we could still lose it) and internet (a miracle, considering our cable tends to go out during a regular windy day, never mind a hurricane). We've had a tree fall in front of our house (not hitting our house, thank goodness, though we jumped when we heard the snap) and we live inland and on a hill, so no worries of flooding here. Our main concern 'round these parts is the wind and the trees. But we in central Queens are lucky. I know a subplot when I see one. Subplots are secondary plotlines involving supporting characters. Sometimes they link with the main character's storyline, sometimes they don't. As I have my editorial cap on at the moment--reading my printed out WIP ten or twenty pages at a time, marking it up, making notes, etc.--I'm taking note of what is a subplot and what is not. I'm also seeing that I might need to eliminate some as I go along. In Plot & Structure by James Scott Bell, Bell says subplots, too, must be written with a character, their desires and a conflict in mind. He didn't mention how much space a subplot should take up or how many there could be in a roughly 90,000 word novel. 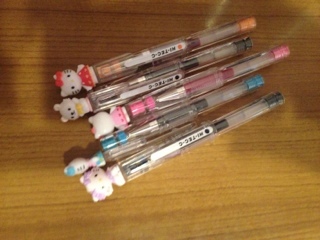 It's time to break out the cute Hello Kitty pens and get scribbling. There's something playful about scribbling, crossing out, circling, writing notes and questions on a printed out version of your story, no matter how long it is. I remember the last time I did a revision--Last Request--and I went a wee bit overboard on the highlighting. In fact, I think I even stuck some of those Post-It page marker flag things on it, for whatever reason. I had a color-coded system of highlighting everything, along with scribbled remarks, comments, cursing and exhortations to a higher power. I can be a little dramatic. This post contains spoilers. Don't read if you haven't been watching the latest season of Downton Abbey. Disclaimer:I do not own the movieOnceor the musicalOnceor any of the songs written by The Script, clearly. This is purely for entertainment purposes, based on an idea that my friend and I riffed out while cutting through the crowd in Times Square after seeingOncethe musical. Part Five The song was finished. The guy pressed a few keys on his computer and listened to the playback. This was a more restrained song that any of his past ones. It was less morose as well. The guy supposed he was moving on from his ex-girlfriend, which was good. But if he was moving on from her, what would he write about now? Downton Abbey is back, though it won't be shown here in the States until January. Being impatient, I am unable to wait that long without being completely spoiled, so, yes, I have been watching. I find that I love costume drama-romancey-fantasy things more when there's a dose of something different in the mix: a rebellious character or a sweeping social change or a cultural confrontation, an injection of reality and conflict amidst the fantasy of what the past would have been like, if one was rich. This is the root of my own work-in-progress.